GORGEOUS DREAM HOME. FIVE BEDROOM PLUS BONUS ROOM OR EXTRA BEDROOM, 4 FULL BATH 2 HALF BATH AND OVER-SIZED 3 CAR GARAGE ! This was Picasso Model Home for Richmond American Homes see document tab for all the upgrades. 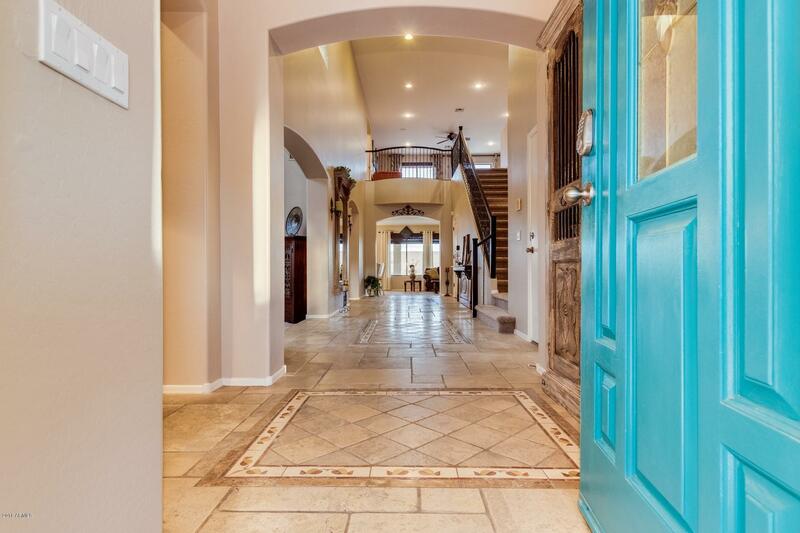 It sits on a large premium lot with unobstructed superstition mountain views. Features include formal living room with a fireplace, formal dining area, 2 family rooms. The spacious eat in kitchen includes maple cabinets an island with a bar, tile back-splash, granite counters, breakfast room, stainless steel appliances, built in microwave, built in desk. There's a coffee bar, and a half bath for guests. Master bedroom has stairs with Juliet balcony that go to sitting area with fireplace and wet bar. Master bath has separate shower/tub, dual vanity, custom walk in closets. Second loft upstairs that has fabulous mountain views. The guest rooms each have their own full bathrooms, most with a dual vanity. Gorgeous resort style backyard! Features include a sparkling pool, full length extended covered patio across back of house, upper terrace with sliding doors to master and upper living room, intercom system to patio/house, self cleaning Paddock Pool with waterfall and pebble tech finish, and a wall to hide the pool equipment. Gorgeous home, great pricing for all the upgrades. This home is on Solar please see document tab so you can view statements showing the low utility bills. This home is a must see!!! !